Hundreds of millions of network cameras have been installed throughout the world. Each is capable of providing a vast amount of real-time data. Analyzing the massive data generated by these cameras requires significant computational resources and the demands may vary over time. Cloud computing shows the most promise to provide the needed resources on demand. In this article, we investigate how to allocate cloud resources when analyzing real-time data streams from network cameras. A resource manager considers many factors that affect its decisions, including the types of analysis, the number of data streams, and the locations of the cameras. The manager then selects the most cost-efficient types of cloud instances (e.g. CPU vs. GPGPU) to meet the computational demands for analyzing streams. We evaluate the effectiveness of our approach using Amazon Web Services. Experiments demonstrate more than 50% cost reduction for real workloads. See https://ieeexplore.ieee.org/document/8594612. Early access. Scheduled for publication in early 2019. 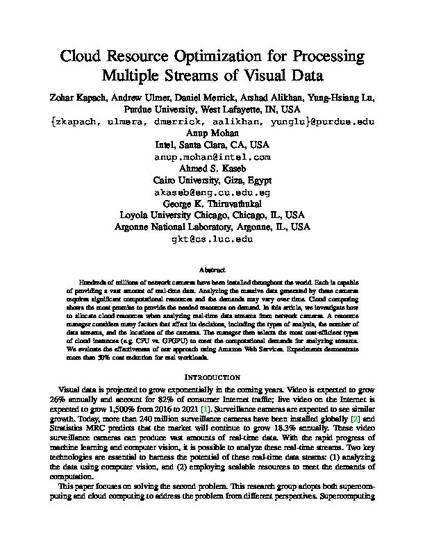 Zohar Kapach, Andrew Ulmer, Daniel Merrick, Arshad Alikhan, Yung-Hsiang Lu, Anup Mohan, Ahmed S. Kaseb, and George K. Thiruvathukal, Cloud Resource Optimization for Processing Multiple Streams of Visual Data, IEEE Multimedia 2019 (to appear).